2. Create a VNC password. 5. If vncviewer is not installed on your PC install it. 6. 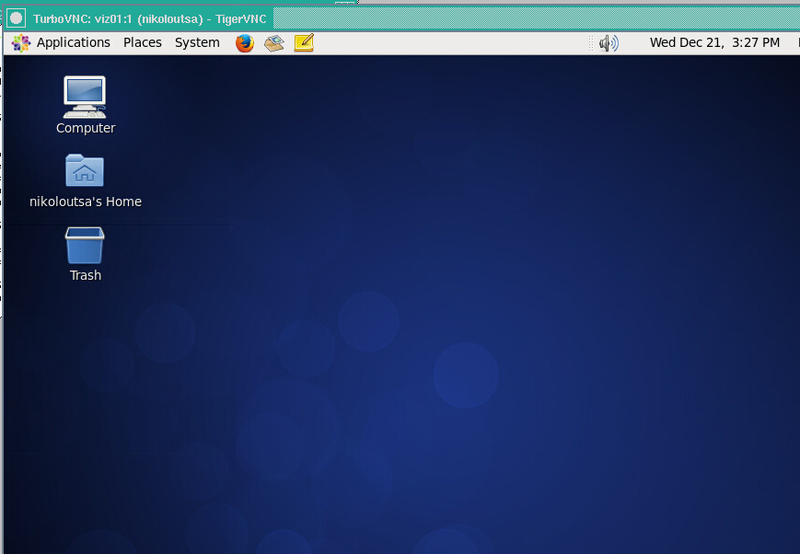 Run TurboVNC Viewer from your PC. 7. Access the visualization node. From any terminal submit the SLURM script to visualization partition. ARIS provides the capability to perform interactive visualization processing of your data. Two visualization servers provide high-end GPU rendering capabilities to enable the use of OpenGL and GPU accelerated graphic applications. The user can run the visualization application on the ARIS nodes (where he has fast access to to the shared filesystem of ARIS) instead of their local desktop workstation without transferring any data locally. The password must be at least six characters long and only the first eight characters are significant. hostname : <login01>,<login02> set the hostname your are connected to from step 1. Set the hostname you are connected from step 1. At this point, you should type the VNC password created in step 1. 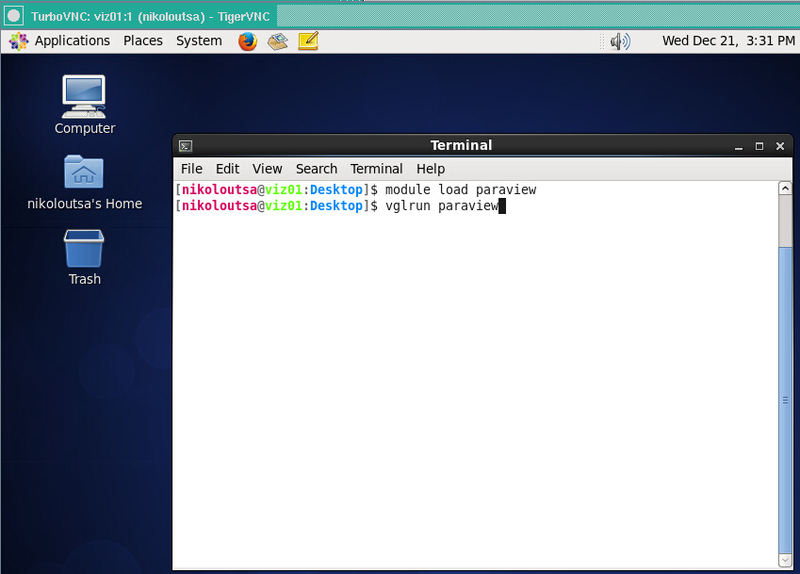 After this you’ll see a very minimal VNC session on login node with just a terminal. Your vizualization software will use the resources assigned to your job. 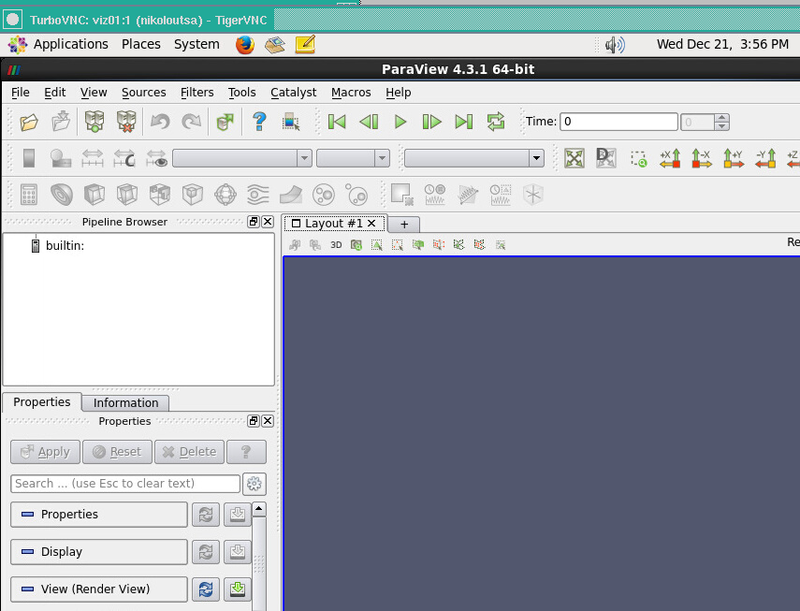 It is crucial to start all visualization software with the vglrun command. Without vglrun software will not start. After visualization, you should logout from your gnome desktop. If you ommit this step, the desktop will remain active for the period requested in your SLURM script. if you ask 6 hours in your visualization job, and forget to logout from gnome desktop, your session will be terminated automatically 6 hours after job start. The use of visualization partition consumes core hours from your budget. Don’t forget to logout to avoid reserving resources and consuming core hours doing nothing.